With temperate weather patterns and a reputation for a premature spring, Georgia is home to a profusion of early flowering trees and shrubs. Ornamental cherry trees sometimes called flowering cherry trees are putting on a beautiful show during this time of the year with their array of lush white, pink and lavender blooms. 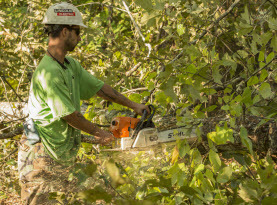 The knowledgeable experts at Milam’s Tree Service recommend marking your calendar to take advantage of our professional pruning services during the dormant season to reduce the risk of your cherry trees blooming at the wrong time. Flowering Cherry Trees are renowned for their beautiful blossoms and the trees are often used to create visual interest in parks, front lawns, and lining sidewalks. Ornamental cherry trees make highly effective screen shades. In fact many varieties display brilliant autumn leaves which provide a stunning display even after the tree has finished blooming for the year. There are wide selections of ornamental cherry tree varieties available within the United States. Among the most common are the Kwasan Japanese flowering cherry, the Taiwan cherry, and the Yoshino flowering cherry. Each of these varieties grows well in the warm to moderate climates found in the southern states. The significance of the cherry blossom tree in Japanese culture traces back hundreds of years. In Japan, the cherry blossom represents the fragility and beauty of life. It is a symbol of remembrance that while life is almost overwhelmingly beautiful, it is also tragically short. •	Select a healthy tree for planting that is approximately 1 year old. •	Carefully select a location that is exposed to full sun with well-drained soil as cherry trees do not tolerate wet or overly moist ground. •	Arrange to have the pH level of your soil tested. Cherry trees perform best in slightly acidic soil within the 6.2 to 6.8 range. •	Ideally your planting hole should be at least twice the width of the root ball. Once you have placed the tree in ground, be sure to check that the base of the trunk is approximately 1 inch above the ground. Fill with soil and gently pack down before thoroughly watering. •	Spread a thick layer of mulch around the base of your cherry tree to help retain moisture. 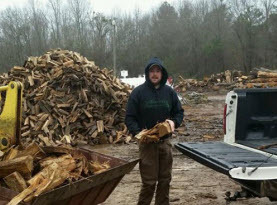 Mulch should be kept at least 6 inches away from the trunk to prevent disease. 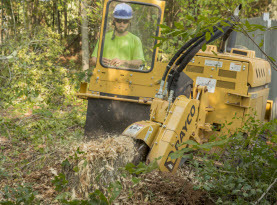 Before planting your cherry trees, please contact Georgia One Call at 1800-282-7411 to ensure that you are not compromising the location of your underground services. 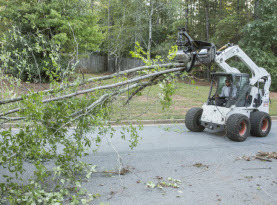 To learn more about professional pruning & trimming services, tree removal, stump grinding and more for your Greater McDonough, GA property, contact the knowledgeable experts at Milam’s Tree Service today.